I bought my Nokia N9 in June 2013. My phone ran fine until last week when I overcharged by phone (10 hrs). the internal circuits burnt and had to be replaced. Today I charged my phone for 4 hrs and it is not starting. Can someone guide me what to do next? shampy, 13 Nov 2013please I just receive a nokia N9 from my brother but I don't know to use it. where the sim is... moreYou need to insert the sim in the sim trey. In the review on this website you can see how it's done. shampy, 13 Nov 2013please I just receive a nokia N9 from my brother but I don't know to use it. where the sim is... moreIt's battery is sealed and gsmarena has a link to the user manual. please I just receive a nokia N9 from my brother but I don't know to use it. where the sim is located? how can I put it on? greenvas, 11 Nov 2013cam not supported when using skype.pls help It does not support Skype video calling. How to make security code at phone. NOKIA N9. noname, 05 Nov 2013I cannot understand any positive review of this phone. Every small task seems to be designed ... moreOf course you cannot understand something you haven't used in the first place. N9 was killed to make nokia users buy lumia 800, which looks like it. Lol. amit, 06 Nov 2013if your battery dead plz charge only battery without your phone charge your battery with batte... moreHi Amit, How u can charge the Nokia N9 battery without the phone since the battery is non user remove able..? The battery type also different most of phone today. I don't think u use N9. Please don't TROLL around ok..
pls can some one help me bcos i can download on my nokia n9 pls how can u help me bcos am feed up. To fix it you have to replace the capacitor! use UPS/ Stabilizers to help you protect and stay safe with the phones! 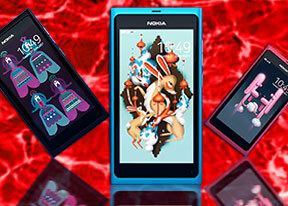 What is wonderful about the Nokia N9? Only the quality of the photographs, apart from that the most simple things such as whatsup is impossible, now MwebTalk is not compatible with the 'phone either. All the possible cost savings are not meant for Nokia N9 users as the apps cannot be loaded! I cannot understand any positive review of this phone. Every small task seems to be designed for the maximum frustration of the user or as a puzzle to be solved. It is easy to see why this company lost its business. I'm sure that its apologists will protest, but the long and short of it is the phone failed miserably in the marketplace and, as is often the case, deserved to fail. My nokia N9 battery was dead.. this happen when i keep it turned off for month but it full charge before i keep. I tired to turn it on again but nothing so i connect the chargger still nothing left it over half hours still nothing.. but im able to revive it by using a 9v battery and now it is charging. Not sure if the battery still hold the same charge after fully depleted. NOTE: never keep nokia phone for month without a single charge. The battery will die.